Salmon Cobb Salad is a modern spin on the classic American Cobb salad. We swapped chicken for salmon which pairs so well with the cilantro lime dressing. 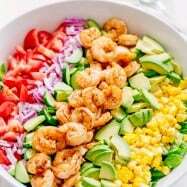 This cobb salad recipe is fresh, healthy, and gets RAVE REVIEWS! 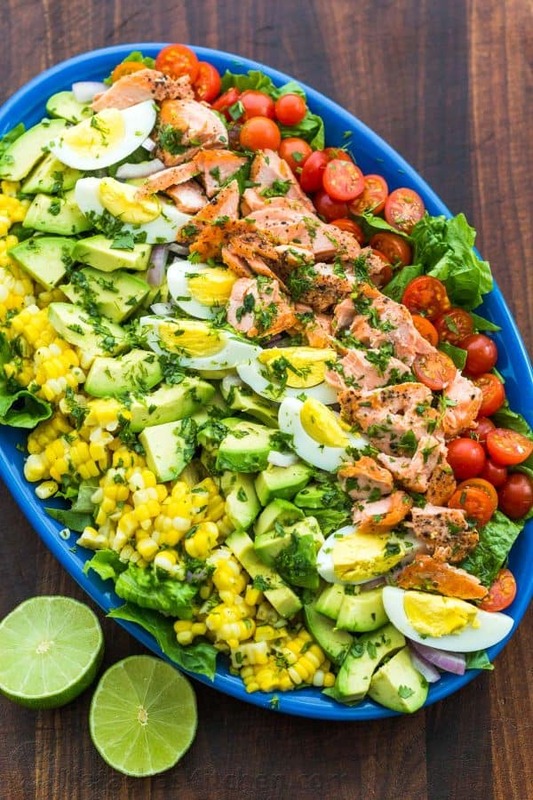 Everything about this Salmon Cobb Salad is good, particularly that my children love it. This was the first lettuce salad that my 3-year old agreed to eat and she asked for more! It is definitely a feel-good, protein packed salad loaded with crisp lettuce, sweet corn, avocados, ripe cherry tomatoes and perfectly cooked eggs. It has a similar flavor profile to our popular chicken avocado salad. It is also gluten free and paleo diet friendly. 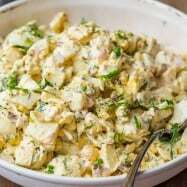 The classic Cobb salad is classic American salad. It is typically made with chicken, tomato, bacon, boiled eggs, avocado, chives and roquefort cheese, all layered in strips over a bed of mixed greens and served with red wine vinaigrette. 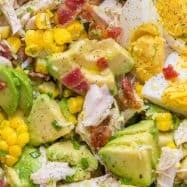 There are several stories circulating about the origin of the Cobb salad but the the most popular is that it was invented by Robert Howard Cobb (a restaurant owner during the Hollywood era). As the story goes, he hadn’t eaten until nearly midnight when he threw together leftovers from the kitchen with French dressing and this iconic salad was born. I just love it when recipes are created following cravings on a hungry stomach. One of my all-time favorite salads was dreamed up that way driving home from a long night-shift when I was working as a telemetry nurse. Use pan wild-caught salmon whenever you can get your hands on it. 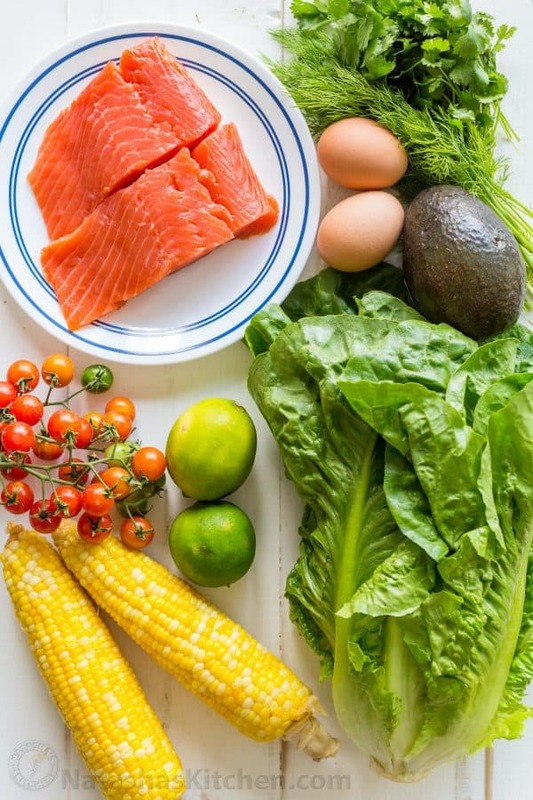 Read more about the differences between wild caught and farm raised salmon here. Fresh corn on the cob generally has the sweetest and best flavor, but when it is not in season, feel free to substitute with frozen (cooked according to package instructions) or well-drained canned corn. Any size, shape or color of tomatoes will work in this recipe. We found that pan seared salmon it is the quickest and easiest way to prepare salmon for a salad. It is the method you will see in the video, but grilled salmon, or even baked salmon would work just as well. If you have leftover salmon from lunch, make this salad for dinner and you will be your own “Robert Howard Cobb!” (see story above). If you enjoy our videos, please subscribe to our Cooking Channel and click the bell icon so you’ll be the first to know when we post a new video. THANK YOU for subscribing. You inspire us daily and it is so exciting to have over 330,000 subscribers now. We love to connect with you on our Youtube Channel. 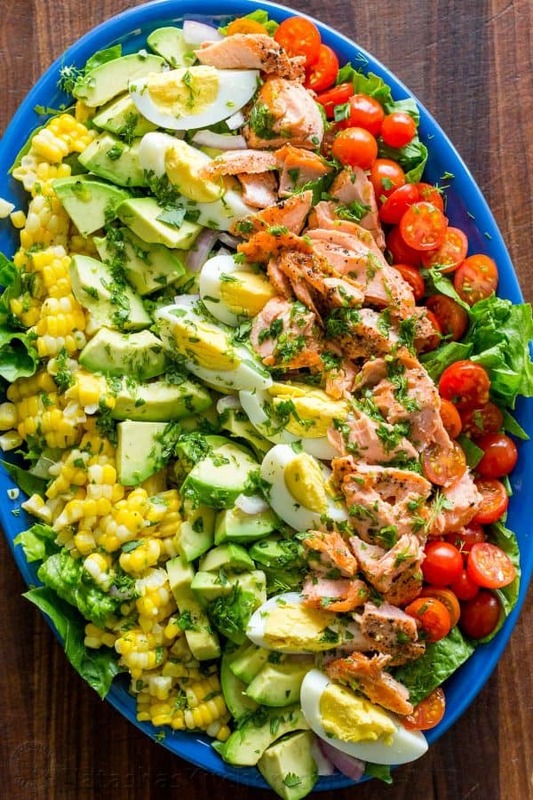 Salmon Cobb Salad is a modern spin on the classic American Cobb salad. 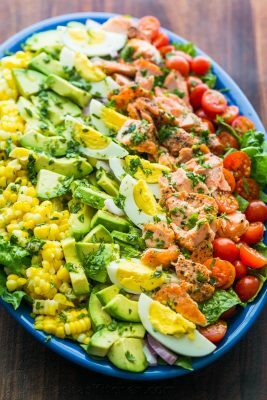 It is definitely a feel-good, protein packed salad loaded with crisp lettuce, sweet corn, avocados, ripe cherry tomatoes and hard-boiled eggs. Season salmon generously with salt and pepper. Heat 1 Tbsp oil in a large non-stick skillet over medium-high heat. Once oil is hot add salmon, top-side down and cook until golden and crisp on the first side (4 minutes) then flip salmon and continue cooking another 4 minutes or until cooked through, depending on thickness of salmon. Transfer to a plate and cool to room temperature then flake salmon with forks into bite-sized pieces. Arrange romaine lettuce on a large platter or large shallow bowl. 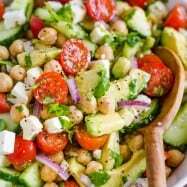 Arrange remaining salad ingredients in rows over the romaine lettuce; cooked corn kernels, sliced onion, quartered eggs, sliced avocado, and halved cherry tomatoes. Combine dressing ingredients in a measuring cup and stir to combine. Drizzle evenly over the salad just before serving. Do you have any food stories of your own? 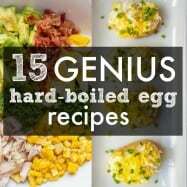 Have you ever invented a recipe or made it better than the original by following your cravings? Let me know in a comment below :). Natasha, the story you have about the origin of the Cobb Salad is absolutely true. Bob Cobb was the owner of the famous Brown Derby restaurant in Hollywood, which closed in the mid-80’s. The salad was presented in it’s layers to the customer at the table, where the server asked if they would like it tossed–you know, like the classic Caesar was tossed at the table. I consider myself a ‘cobb-snob’ in that–I often order (and critique!) the Cobb in restaurants, and wish more restaurants would make it the classic way. While I guess it’s okay for chefs to make it their own way, to get the true classic, I like to make it at home. The biggest annoyance at restaurants: the salad greens are also supposed to be finely chopped like all the top ingredients. 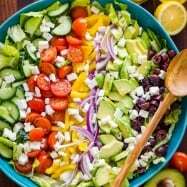 Make one up like this and give it a try–chop the greens, and chop all ingredients–not wedge, not sliced, but chopped. You will love it this way!